The rubber bands will be attached to the brackets on one’s braces. This is done in that a small latex rubber band that has been given to a patient by one’s orthodontist will attach on one bracket and go vertically or diagonally down to another. Two different bands will be used with one on each side of one’s teeth. The bands will be used to help with applying tension onto one’s teeth that will go onto a bracket and creates the right amount of pressure to move teeth in directions as desired that the braces alone can’t. This tension is also sufficient to correct an overbite or an underbite in the jaw. Over time this will be used as a means of helping to get the teeth to work properly in conjunction with other parts of the jaw. Inter-arch elastics is extrusive (causing extrusion of teeth involved) and can cause the rotation of the occlusal plane. The rotation of the occlusal plane helps to correct the relationship between the upper and lower back teeth but it can be deleterious in some patients because elongation of the teeth may cause undesirable rotation of the lower jaw or undesirable tooth-lip relationship. Hence, most of the time, it requires good vertical growth of the jaws (growing patients) for acceptable results. How can I handle the problems with the rubber bands? From a material point of view, the greatest problem with all types of rubber is that they absorb water and deteriorate under conditions inside the mouth. Rubber bands get tired and lose their stretch so change them every day so the force is constant which the teeth like. A lack of consistency in wearing rubber bands can bring treatment to a standstill. You should wear the elastics exactly as instructed. If one should break or fall off it should be replaced immediately. You should always carry extra elastics with you so that you can replace them immediately. If this is impossible, then the other elastic should be removed and you should resume elastic wear as instructed as soon as possible. It will help to know when using rubber-bands for dental braces that some restrictions are going to be required. A person should not eat any solid foods when the rubber bands are being worn. If a person is going to consume something, the person will have to do it after removing the bands. The bands will then have to be placed back onto the braces after eating. It will also help to make sure that one’s mouth does not get stretched out too high to the point where the bands could break or slip off. However, as with braces, most wearers get used to the rubber bands within a short period of time, and are thankful they had them when they see the accelerated progress of their teeth. These come in a variety of colors, but their size is usually uniform. Your orthodontist will change your elastics at every appointment, since they lose strength over time. Depending on how the elastic is tied onto the tooth, a varying degree of force can be applied to the teeth. These come in a variety of colors and strengths. Connected elastic ligatures are used by your orthodontist to close spaces between the teeth, or move specific groups of teeth together at the same time. Connected elastic ligatures may be changed at each appointment, and also come in a variety of different colors. It simply must be kept in mind that when rubber bands are used, the forces decay rapidly, and so can be characterized better as interrupted rather than continuous. Although larger spaces within the dental arch can be closed by sliding teeth with rubber bands or elastomeric chains, the same tooth movement can be done much more efficiently with A-Nickel-Titanium (NiTi) springs that provide a nearly constant force over quite a large range. 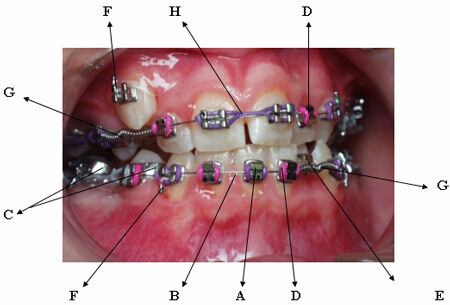 (A) Brackets- Metal attachments which are bonded directly to the teeth. (B) Arch wire- Runs through a slot in the brackets to provide pressure to slowly move teeth. (C) Bands- Metal rings which are cemented around the bicuspid or molar teeth. (D) Single elastic ligatures- Coloured or clear tiny elastics that hold the archwire into the bracket. (E) Ligature wire- Tiny wires that tie the archwire into the bracket instead of using a module. (F) Hooks- Used to attach elastics (rubber bands). (G) Coil Spring- Fits between brackets and over arch wires to hold or expand space. (H) “C” Chain- Connected elastic ligatures. A great, detailed description of the how and why of elastics used for braces. Thanks for the photo-diagram. Thankyou for the imformation, it really helped, where are the rubber band’s placed ? The rubber bands are placed around each bracket to hold the arch wire into the brackets. The connected ones have an extra function to close up spaces between teeth. Hope this information helps you to understand more. Great descriptive explaination on the use of rubber bands. Really got down to the bottom line of why they are useful and the great effects they can on you smile and jaw! do i need to use rubber bands even if im wearing self-ligating braces? Nope you do not need to use rubber bands then. The self-ligating brackets use a slide mechanism to hold the arch wire, therefore ligature rubber bands or wires are not needed. However, other types of rubber bands may be needed for other purposes. Hope you get what I meant.